Excelsior has impressed in the Dutch Eredivisie so far astonishing both fans and opponents with their exceptional results. A relegation battle was expected but now, 25 games later, Excelsior sit comfortably in 10th and are practically safe from relegation. The Rotterdam-based club has the second smallest budget of the Eredivisie, at just a shy 6.2 M. It’s been a remarkable season mostly empowered by one man: Mitchell van der Gaag. The Dutch coach has been at the club since the start of last season and has managed to keep Excelsior in the Eredivisie, despite the odds being against him. Another noteworthy fact is Excelsior’s impressive record away from home: They’ve picked 22 out of their 32 points up away from home. A stat that ranks them 4th in the away table, above the likes of Feyenoord and Vitesse. We’ve got to take a look at van der Gaag’s history both as a player and as a manager to understand why Excelsior are doing this well. Van der Gaag has a rich history in Portugal, both as a player as well as a manager. He brought European football to Maritimo as a coach, developed his coaching badges in Portugal before promoting Belenenses to the highest Portuguese division. One main difference that Portugal has with his native country is their approach to the game. Portuguese football prefers a clean sheet over a goal scored. There’s a lot of emphasis on playing out from the back in the Netherlands while clearing the ball does no harm in Portugal. It’s a mentality that won Portugal the European Championship in 2016 and has been fully integrated into van der Gaag’s approach to the game. November 2017, Excelsior has got the best xG (defence) of the entire Eredivisie (@11tegen11). It basically means they were expected to concede the least amount of goals per game out of all Eredivisie sides. Now, this number may have shifted a bit, but Excelsior is still looking good in February 2018. A confirmation of van der Gaag’s tactical capabilities and ability to set-up a team to its strength. Something he’s been doing ever since he was appointed as Maritimo manager. But how does this translate onto the pitch? 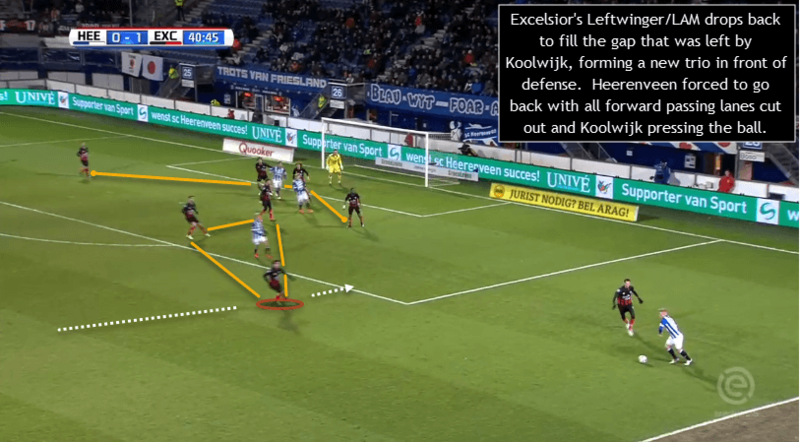 For this article, I’ll take a look at Excelsior’s performance against Sc Heerenveen last weekend. An outing which they managed to narrowly win despite being the underdogs. Van der Gaag doesn’t necessarily believe in strict formations like a 4-3-3 or 4-4-2. However, Excelsior’s defensive set-up can be best described as a 4-3-3. They used a flat 4-3-3 formation with an extremely deep midfield trio, who cover the space just before their back 4. 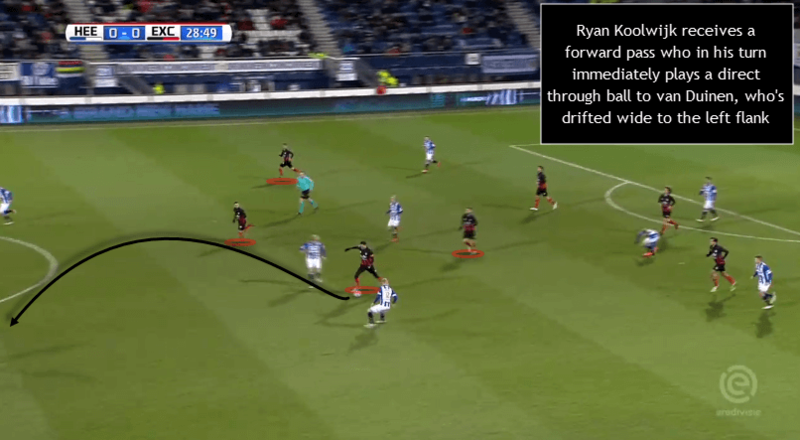 Their fullbacks are positioned fairly narrow in the latter stages of defence, crowding the box which limits Sc Heerenveen’s space to operate. The midfield trio has two main tasks: pressure the man in possession of the ball and cut out passing lanes. A very compact system which leaves little to no space for Heerenveen, often resulting in shots from distance. 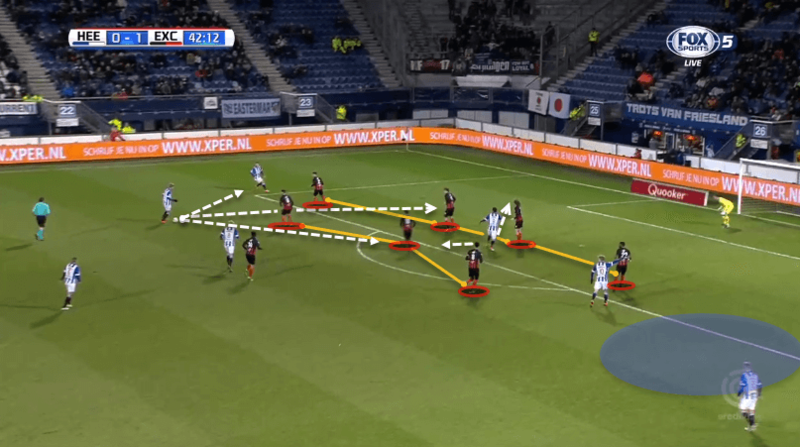 Both Excelsior’s RCM and CM will intercept any passes made towards Heerenveen’s striker. As you can see above a narrow defensive shape does allow the opponents to exploit the wing. Mitchell van der Gaag has a solution for this though. I believe that you’ll improve as a player when you put in hard work during training sessions. You’ll also have more focus and sharpness when you are physically strong. Their ability to maintain their style of play over a longer period is clearly paying dividends. It’s also recognised by Whoscored.com’s algorithm: Excelsior are able to see out games when taking a lead. Let’s take a look at Excelsior’s set-up in the attack phase. Their fullbacks are located relatively high up the pitch offering width and stretching the play if necessary. Luigi Bruins often offers support in midfield and acts more like an inside forward rather than a traditional winger. Meanwhile, their striker, Mike van Duinen, often drifts wide to the left to exploit any open spaces. This then creates a gap in the middle which could be exploited by their rightwinger or one of their CM’s. 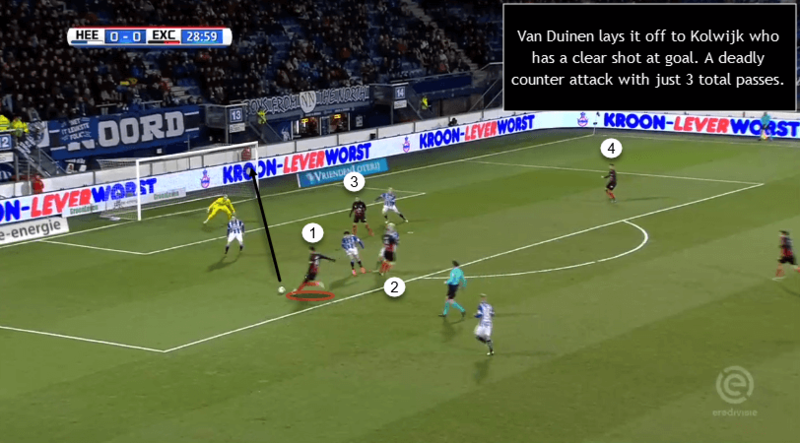 Van der Gaag also prefers to have 3 attackers the opponent’s box to help them creating goalscoring opportunities. This gives a good balance in attack and in defence which leaves them less vulnerable to possible counter opportunities. Let’s see how this works out in Excelsior’s counter mentality. Three passes later, and Excelsior has travelled the entirety of the pitch creating a good goalscoring opportunity. This requires discipline from all players who need to travel an insane amount of distance. For instance, Ryan Koolwijk, 32, is not a player known for his mobility. Yet, at his age, he’s able to run the entirety of the pitch getting at the end of a counter attack. It’s the hard work in training that’s paying dividends for van der Gaag’s men. Van der Gaag is a wanted manager and linked to taking over the Vitesse job. However, he’s grateful for what he has and stated he’s happy at Excelsior. Back in 2013, the Zutphen-born manager suffered a heart-attack during a game between Belenenses and his old club Maritimo. He luckily survived after his defibrillator reset his heartbeat. It’s a dark page in the history books of Mitchell van der Gaag but he’s very optimistic about his future. And so are his fans. Van der Gaag is one of the most talented managers around and I definitely wouldn’t be surprised if he becomes the next PSV manager, with Phillip Cocu’s reign coming to an end.